Use blender and blend all ingredients until fine sauce. Cut and prepare all vegetables, set aside. Bring water to boil in a pot. At boiling stage put all the seafood and take it out when cooked. Use the boiling water to boil the vermicelli noodles then drained out. 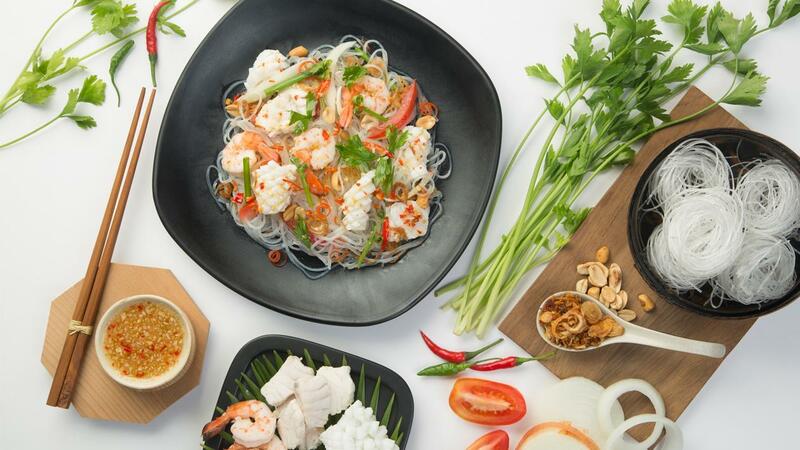 In the mixing bowl mixing all seafood, vermicelli and vegetables, then add spicy dressing. Combined all together and serve. Decorate with fried shallots, peanut, red chilli and coriander leaves.